at need to be replaced at first if attempting a healthy dessert — sugar, dairy butter and flour (maida). With growing consciousness about ingredients, there is a gradual shift in consumer mindset towards more healthy and functional ones, which are rich in micro and macronutrients. As a result, chefs and patissiers are whipping up calorie-restricted indulgences. 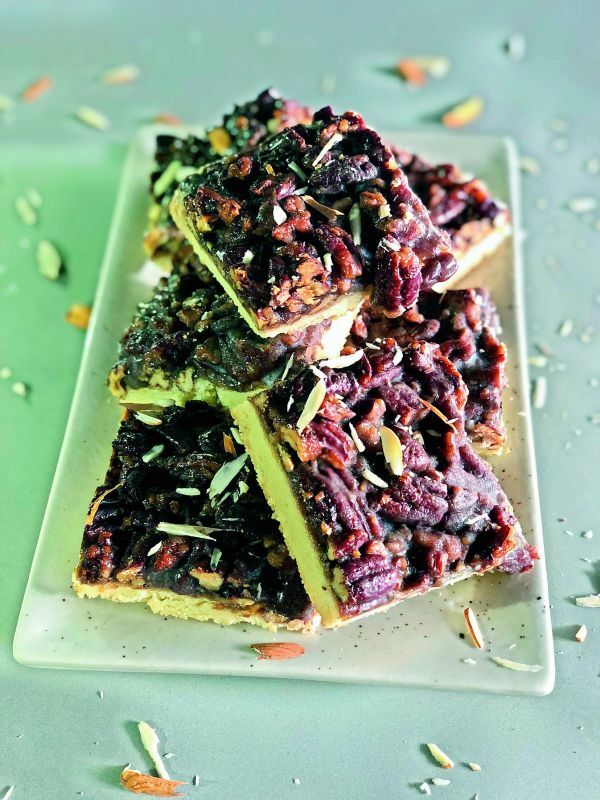 But for noted chef Pooja Dhingra who runs the very popular Le15 Patisserie, it was her personal commitment to eat clean and stay lean that paved the way to her healthy desserts. “Being in the dessert space can make it tough to stick to the goals. So, I wanted to create treats that are packed with goodness and still be indulgent,” says the pastry chef who specialises in macrons and an assortment of French desserts. In her decadent chocolate cake, Pooja replaces sweeteners with honey and dates and tries her best to use fresh and natural ingredients as far as possible. And to bring in the required richness, coconut milk is used along with walnuts for an added crunch. “I also use great quality Belgian dark chocolate — as dark chocolate has proven to have heart-healthy benefits,” she says. Preheat your oven to 1800C. Line an 8-inch baking pan with parchment paper, and set aside. In a bowl, stir the almond butter with a whisk to loosen up the consistency. Add in the applesauce and stir to combine. In a separate bowl, combine baking soda, salt, flour, sugar, and half the chocolate chips. Mix with apple sauce mixture and whisk till gooey dough is formed. If it is too dry, add one teaspoon milk. It should resemble cookie dough. Add ¾ of the apricots and fold in very gently. Pour the batter into a 9” tin lined with butter paper. Smoothen the top with the back of a spoon. 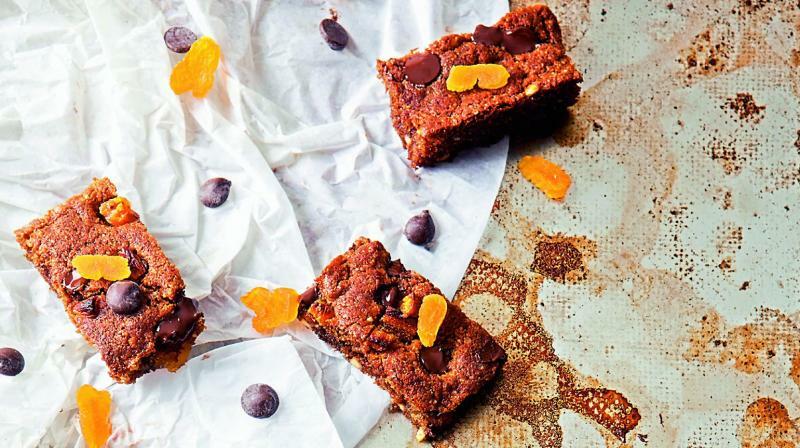 Top with the remaining chocolate chips and apricots. Bake in a preheated oven at 1800C for 15 to 20 minutes or until a skewer comes out clean, when inserted. Leave to set as is at room temperature for two to three hours or overnight before de-moulding. Preheat the oven to 1600 C.
To make the shortbread dough, put the pecans in a food processor and grind them to a flour consistency. It should look like any other nut flour. Add the remaining ingredients and pulse to combine. Wrap the dough in a cling film, and store in the fridge for 30 minutes, until firm. Roll the dough until ¼ inch thick. Transfer it to a 4 X 6 baking tray. Bake for 14-16 minutes until golden. Remove from the oven and cool. While it cools, make the filling. For the filling, toast the pecans for eight minutes. Remove and cool. Place the remaining ingredients in a non-stick pan over medium heat and whisk constantly for four to five minutes., until the sauce looks thick, smooth and golden-brown. Bake it for another 15 minutes at 1600 C. Let it cool for at least an hour before cutting it up into squares.